Indeed, ancient Greek music has long posed a maddening enigma. Yet music was ubiquitous in classical Greece, with most of the poetry from around 750 B.C. 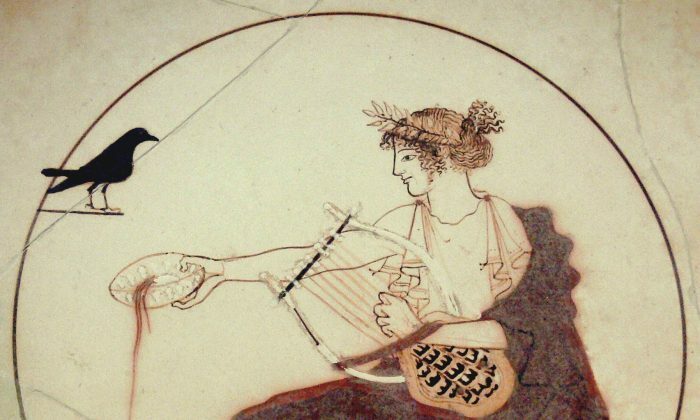 to 350 B.C.—the songs of Homer, Sappho, and others—composed and performed as sung music, sometimes accompanied by dance. Literary texts provide abundant and highly specific details about the notes, scales, effects, and instruments used. 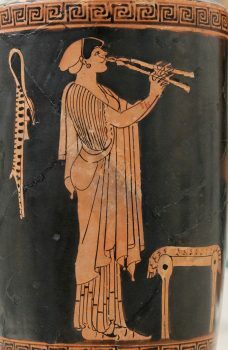 The lyre was a common feature, along with the popular aulos, two double-reed pipes played simultaneously by a single performer so as to sound like two powerful oboes played in concert. Despite this wealth of information, the sense and sound of ancient Greek music has proved incredibly elusive. This is because the terms and notions found in ancient sources—mode, enharmonic, diesis, and so on—are complicated and unfamiliar. And while notated music exists and can be reliably interpreted, it is scarce and fragmentary. 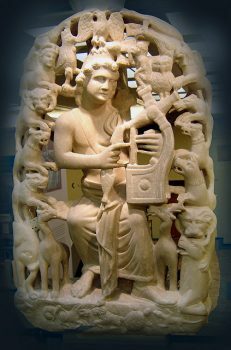 What could be reconstructed in practice has often sounded quite strange and unappealing, so ancient Greek music had by many been deemed a lost art. But recent developments have excitingly overturned this gloomy assessment. 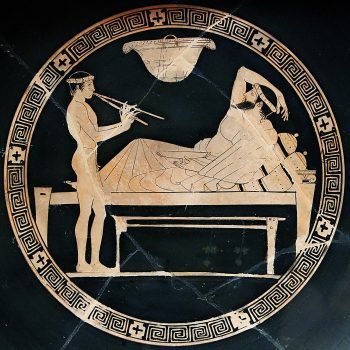 A project to investigate ancient Greek music that I have been working on since 2013 has generated stunning insights into how ancient Greeks made music. My research has even led to its performance—and hopefully, in the future, we’ll see many more such reconstructions. The situation has changed largely because over the past few years, some very well preserved auloi have been reconstructed by expert technicians such as Robin Howell and researchers associated with the European Music Archaeology Project. Played by highly skilled pipers such as Barnaby Brown and Callum Armstrong, they provide a faithful guide to the pitch range of ancient music, as well as to the instruments’ own pitches, timbres, and tunings. Central to ancient song was its rhythms, and the rhythms of ancient Greek music can be derived from the meters of the poetry. These were based strictly on the durations of syllables of words, which create patterns of long and short elements. While there are no tempo indications for ancient songs, it is often clear whether a meter should be sung fast or slow. (Until the invention of mechanical chronometers, tempo was in any case not fixed, and was bound to vary between performances.) Setting an appropriate tempo is essential if music is to sound right. What about the tunes—the melody and harmony? This is what most people mean when they claim that ancient Greek “music” is lost. Thousands of words about the theory of melody and harmony survive in the writings of ancient authors, such as Plato, Aristotle, Aristoxenus, Ptolemy, and Aristides Quintilianus, and a few fragmentary scores with ancient musical notation first came to light in Florence in the late 16th century. But this evidence for actual music gave no real sense of the melodic and harmonic riches that we learn of from literary sources. 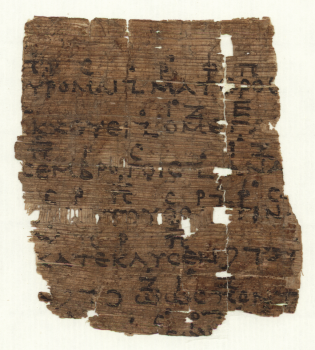 The earliest substantial musical document, found in 1892, preserves part of a chorus from the Athenian tragedian Euripides’s “Orestes” of 408 B.C. It has long posed problems for interpretation, mainly owing to its use of quarter-tone intervals, which have seemed to suggest an alien melodic sensibility. Western music operates with whole tones and semitones; any smaller interval sounds to our ears as if a note is being played or sung out of tune. Second, I showed that if the quarter-tones functioned as “passing notes” [or transitional notes from one chord to another], the composition was in fact tonal (focused on a pitch to which the tune regularly reverts). 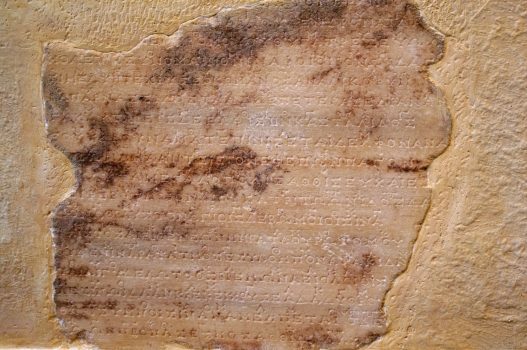 This should not be very surprising, as such tonality exists in all the documents of ancient music from later centuries, including the large-scale Delphic Paeans preserved on stone. With these premises in view, in 2016 I reconstructed the music of the “Orestes” papyrus for choral realization with aulos accompaniment, setting a brisk tempo as indicated by the meter and the content of the chorus’s words. This “Orestes” chorus was performed by choir and aulos player at the Ashmolean Museum, Oxford, in July 2017, together with other reconstructed ancient scores. It remains for me to realize, in the next few years, the other few dozen ancient scores that exist, many extremely fragmentary, and to stage a complete ancient drama with historically informed music in an ancient theater such as that of Epidaurus. Meanwhile, an exciting conclusion may be drawn. The Western tradition of classical music is often said to begin with the Gregorian plainsong of the ninth century A.D. But the reconstruction and performance of Greek music has demonstrated that ancient Greek music should be recognized as the root of the European musical tradition. Armand D’Angour is an associate professor of the classics at the University of Oxford in England. This article was originally published on The Conversation.